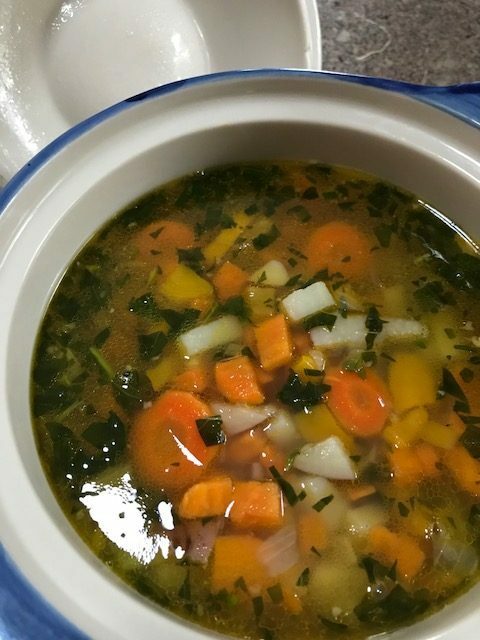 The short hand version of this recipe is to start with chicken bone broth, homemade if possible; heat up 3-4 Tbs coconut oil and sauté a diced sweet potato, purple onion, regular potatoes, carrots, yellow sweet pepper until tender; add them to the broth and season with Real salt and fresh basil. This is a very homey, nourishing, salty and sweet dish. It would be good with rice and or a can of coconut milk if you’d like creamy soup. Add a loaf of good bread, some greens and a light dressing and you’ve got a lovely meal. Sauté vegetables in coconut oil until tender. Add the broth and basil and simmer for 20-30 minutes. Add coconut milk if you’d like it creamy!